Data discovery & classification is part of the Advanced Data Security (ADS) offering, which is a unified package for advanced SQL security capabilities. data discovery & classification can be accessed and managed via the central SQL ADS portal. This document relates to Azure SQL Database and Azure SQL Data Warehouse. For simplicity, SQL Database is used when referring to both SQL Database and SQL Data Warehouse. 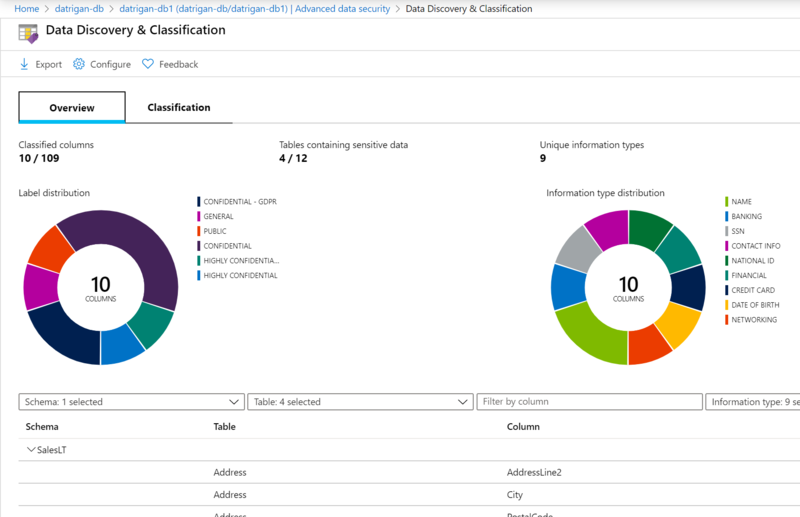 For SQL Server (on premises), see SQL Data Discovery and Classification. The classification engine scans your database and identifies columns containing potentially sensitive data. It then provides you an easy way to review and apply the appropriate classification recommendations via the Azure portal. Sensitivity classification labels can be persistently tagged on columns using new classification metadata attributes introduced into the SQL Engine. This metadata can then be utilized for advanced sensitivity-based auditing and protection scenarios. The sensitivity of query result set is calculated in real time for auditing purposes. The database classification state can be viewed in a detailed dashboard in the portal. Additionally, you can download a report (in Excel format) to be used for compliance & auditing purposes, as well as other needs. Labels – The main classification attributes, used to define the sensitivity level of the data stored in the column. Information Types – Provide additional granularity into the type of data stored in the column. SQL data discovery & classification comes with a built-in set of sensitivity labels and a built-in set of information types and discovery logic. You now have the ability to customize this taxonomy and define a set and ranking of classification constructs specifically for your environment. Definition and customization of your classification taxonomy is done in one central place for your entire Azure tenant. That location is in Azure Security Center, as part of your Security Policy. Only someone with administrative rights on the Tenant root management group can perform this task. As part of the Information Protection policy management, you can define custom labels, rank them, and associate them with a selected set of information types. You can also add your own custom information types and configure them with string patterns, which are added to the discovery logic for identifying this type of data in your databases. Learn more about customizing and managing your policy in the Information Protection policy how-to guide. Once the tenant-wide policy has been defined, you can continue with the classification of individual databases using your customized policy. Navigate to Advanced Data Security under the Security heading in your Azure SQL Database pane. Click to enable advanced data security, and then click on the Data discovery & classification (preview) card. The Overview tab includes a summary of the current classification state of the database, including a detailed list of all classified columns, which you can also filter to view only specific schema parts, information types and labels. If you haven’t yet classified any columns, skip to step 5. To download a report in Excel format, click on the Export option in the top menu of the window. To begin classifying your data, click on the Classification tab at the top of the window. Review the list of recommendations – to accept a recommendation for a specific column, check the checkbox in the left column of the relevant row. You can also mark all recommendations as accepted by checking the checkbox in the recommendations table header. An important aspect of the information protection paradigm is the ability to monitor access to sensitive data. 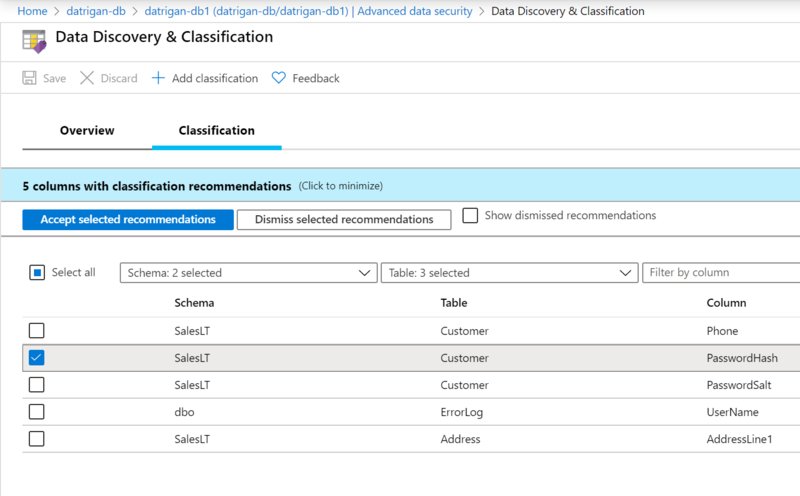 Azure SQL Database Auditing has been enhanced to include a new field in the audit log called data_sensitivity_information, which logs the sensitivity classifications (labels) of the actual data that was returned by the query. You can use T-SQL to add/remove column classifications, as well as retrieve all classifications for the entire database. When using T-SQL to manage labels, there is no validation that labels added to a column exist in the organizational information protection policy (the set of labels that appear in the portal recommendations). It is therefore up to you to validate this. The following built-in roles can read the data classification of an Azure SQL database: Owner, Reader, Contributor, SQL Security Manager and User Access Administrator. The following built-in roles can modify the data classification of an Azure SQL database: Owner, Contributor, SQL Security Manager. Consider configuring Azure SQL Database Auditing for monitoring and auditing access to your classified sensitive data.